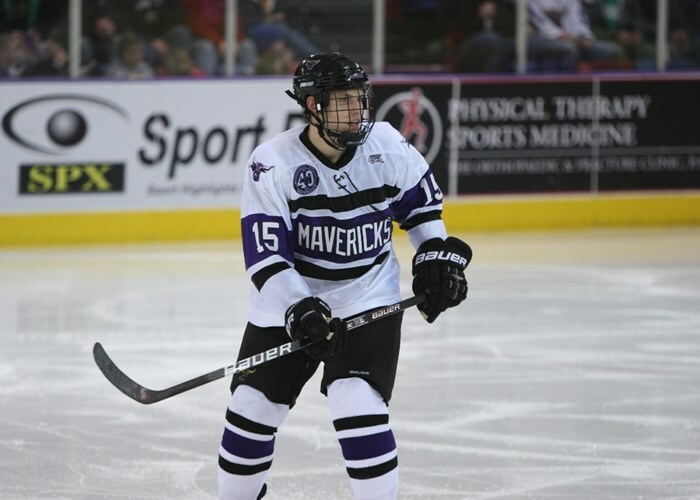 Favorite Team(s):NU Purple Eagles, UND Fighting Sioux, San Jose Sharks, any other team that is fun to watch. Favorite Jersey(s):UND (Green), San Jose (Teal), Chicago (Red), Boston 3rd, and many more. The Boston College away jersey is far and away my favorite. Love the colors. Maine is probably second. I always liked the SIOUX jersey. Does Lake Superior State still have the jersey with the big anchor and "Lakers" on it, like they did in the 90s? The simple graphics on their jerseys were so large and dominant. 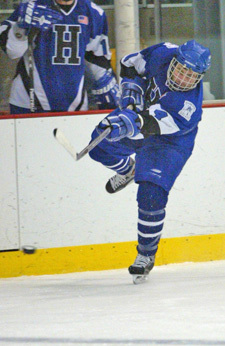 I love the Puckman version of the RPI jersey and I like the St. Cloud jerseys. Those things look really sharp. Has anyone ever looked at the CIS team jerseys? Thunder Bay are pretty good. St. Cloud stole the Habs "C" right? I have the away version of that jersey- I get a lot of compliments on it whenever I wear it! I have to admit, LS, that seeing your Stafford jersey + your avatar, has given me a new appreciation for the ND jerseys. Nice job. Thanks for posting the LSSU jerseys. I'm glad that they retained that jersey all these years. I'd pursue one, but too many people in this town would ask me if it's a LA Lakers jersey. I don't feel like giving the explanation out every time. Hamilton College (my alma mater) and Utica College. Those Hamilton ones are nice. Yeah, Lake Superior State University is probably my favorite. Pretty big fan of the University of Wyoming jerseys. I'll post pics here in a bit. Favorite Jersey(s):The winged wheel - simple, classic, perfect. Almost the same as the Red Wings jerseys and I am an alum. Interests:Collecting Hockey Jerseys, Playing Hockey in my Hockey Jerseys, Crusing eBay and Kijiji in pursuit of more Hockey Jerseys. That is great lettering and I love the secondary logo. Very sharp! As a Notre Dame fan and alum, I actually don't like our jerseys much. The green 3rds we wore in the CCHA's a few years back were pretty awesome though. I like Lake Superior State's a lot, and even though I shouldn't I do like Michigan's. One thing I hate is that lots of teams ripped off the Red Wings jersey design and just changed the front crest. Absolutely hate that, actually. I know it seems to be blasphemy here, but I hate the Wings jersey. Way too bland. At least toronto's old jersey had some stripe variation, and Montreal used more then 2 colors. The white version is okay though, but the red is awful.My personal pick for best all time is either the Blackhawks red or the Rangers white. 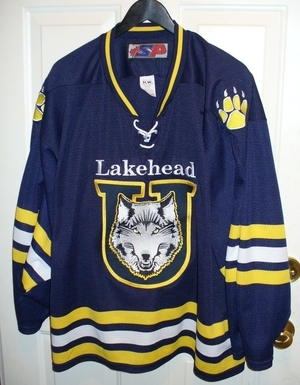 Lakehead's jersey is not too bad - only thing about Thunder Bay is their annoying habit of putting Thunder in their hockey team's name - Thunder Hawks, Thunder Cats, Thunderwolves. Found a 2nd hand replica through kijiji in Thunder Bay. Here's a pic.